Discussion in 'Designers and Collections' started by Urban Stylin, Dec 16, 2003. Im a designer and i hope and pray i dont look anything like this!!! not her best pic(she looks like a sp[oilt kid ) but shes also ok! Or I will kill you! lol! 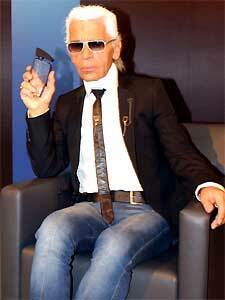 I must say Karl Lagerfeld often creeps me out...more so now when he's thin than before. I think I'd cry if I ever saw him w/o sunglasses. Karl Lagerfeld creeps my mom out in the worst way! she doesn't even like to look at him. Do any of you find him hard to understand sometimes? Anyway... all things aside. I LOVE HIS CLOTHES!!! i wonder why this is the case i mean most of the peole on tfs are fashion people and they all look good!